At first glance, this custom space appears saturated in color. But, look again. It’s neutral. The backdrop of the entire room is a wonderfully warm “greige” – a hybrid of beige and gray pigments. All of the major furniture pieces, though essentially the same neutral tone, are given personality through a variety of textures and tone on tone patterns. In this neutral living room, color is introduced solely on chair seats and touches of colored art glass. Here’s the trick. Peacock inspired accents may not seem like the subtlest of shades, but when used with a light hand, they radiate without overwhelming the space. 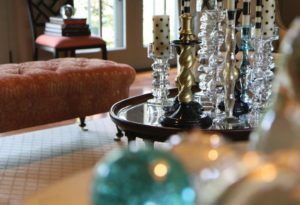 Used in floor length drapery panels, accent pillows, and art, the saturated tones create a sense of warmth and opulence. Best of all, when you feel inspired, the neutrality of the overall design ensures that just a few key changes to the accents will result in a fresh new vibe, without major investment. Article originally seen in the March 2016 edition of Susquehanna Style.